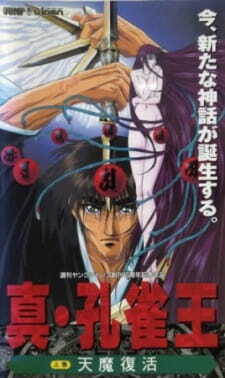 I've seen both anime adaptations of the Spirit Warrior OVA's and I consider this two episode OVA to be the better of the two. Don't misunderstand me this is still a bad anime, but it feels like its a somewhat complete story. From what I gathered the plot is this is an alternate universe where Nazi Germany is still around and an evil Nazi named Siegfried von Mittgard wants to still some magical power from a priest named Kujaku. Its your standard save the world from an ancient evil with the chosen one trope and his ragtag group of characters to help him fight evil. That said it goes into other tropes later on in the anime and then stupid moments that happen later on in the anime, that to put it simply went like I shall save you by maybe killing you. The story feels disjointed at parts and when its not it drags out its run time with exposition and or pointless violence filler. And because of that standard plot, the characters don't have much depth to them and that doesn't help that the English dubbed that I listened to had some of the worst voice performances throughout, some performances for characters were so bad that it mad me happy to see those characters on screen, especially Haushoffer was to me the gem of bad German accents. The animation is fine for the most part as its early Madhouse, even when do they bad anime it looks good. The soundtrack was fine for background noise and well I just didn't remember any memorable track at all. So to finalize my thoughts, its an anime from the 90's and if you like supernatural horror anime made in the era then you might like this anime. And its up your choice if you prefer to listen to the bad English dub or not.